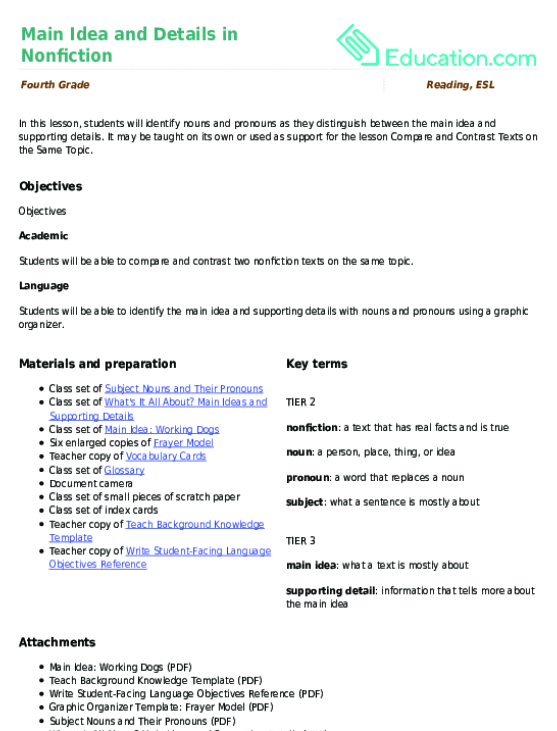 This lesson can be used as a pre-lesson for the Compare and Contrast Texts on the Same TopicLesson plan. Students will be able to compare and contrast two nonfiction texts on the same topic. Students will be able to identify the main idea and supporting details with nouns and pronouns using a graphic organizer. Tell students that, as fourth graders, they need to know how to compare and contrast nonfiction texts. Explain that before they learn how to compare and contrast this type of text, they should practise identifying and telling the difference between the main idea and supporting details. Instruct students to do a choral read of the student-friendly language objective for the lesson. Read aloud the six tiered vocabulary words and their definitions. 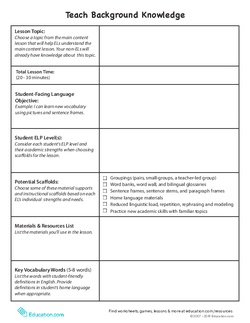 Note: you can display the vocabulary cards for the duration of the lesson for students to refer to. 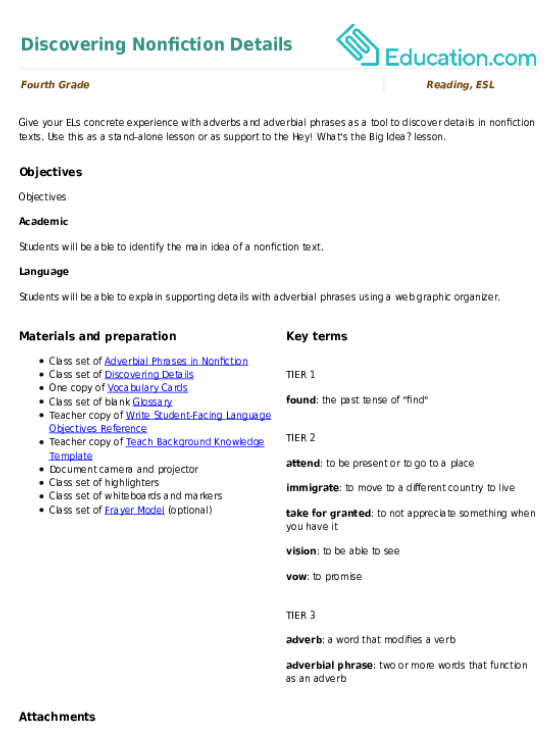 Display one large copy of the blank Frayer Model. 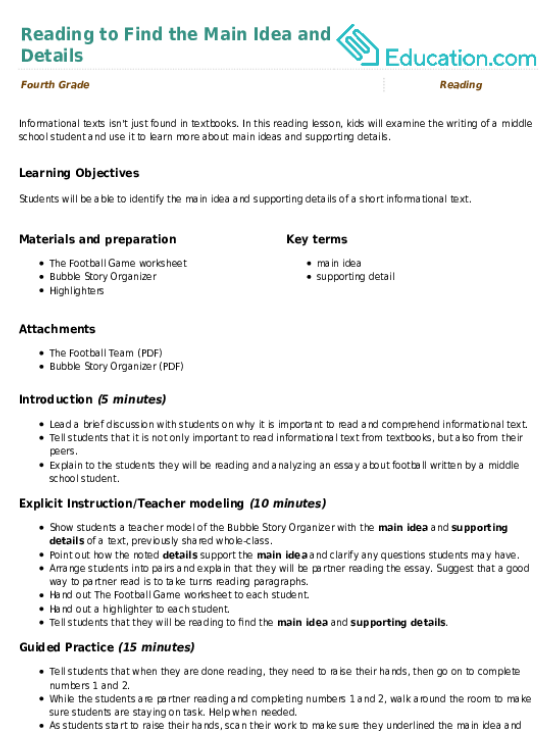 Show students how you complete the model with the word NonfictionBy providing examples and non-examples, and drawing an image to represent the word. Lead students in a carousel activity. 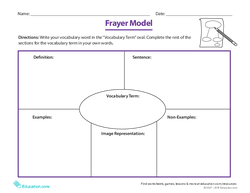 Place the five remaining Frayer Models in different areas of the classroom, one for each of the remaining vocabulary words for the day's lesson. Divide students into five groups and provide each group with a different colored marker. Assign a word for each group to begin with. Instruct students to spend one minute discussing as a group and adding information to the model with their marker. Explain that it is important to not fill out the entire model so that other groups have a chance to add to it. Rotate the groups and have them add pictures, words, and sentences to the Frayer Models until they are all complete. Have each group present the word (whichever word they land on during the last rotation) to the rest of the class. Model your thinking aloud as you identify the noun and pronoun in the first sentence. Repeat this process (model, assign, review) with the second section of the worksheet. Hand out the What's It All About? Main Ideas and Supporting Details worksheet and show a teacher copy on the document camera. 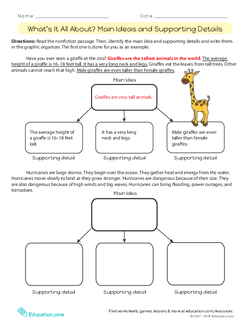 Inform students that they will work with short nonfiction texts to practise telling the difference between the main idea and supporting details. Explain that they will first circle the nouns and pronouns in each passage to figure out the main idea of the text. Elaborate further that the main idea is the big picture, or the main message, of the text. Tell students that the small details are important because they support and give more information to the main idea. Without the supporting details, the reader would not understand as much about the main idea. Invite a student to read the directions aloud. Read aloud the first text and have students read it to a partner for a second read. 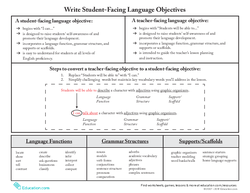 Walk students through the first completed graphic organizer, explaining each supporting detail and its role to support the main idea. 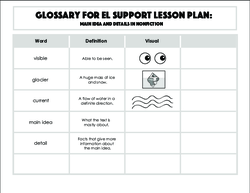 Assign students into effective partnerships and tell them to complete the graphic organizer for the rest of the worksheet. Ask a few nonvolunteers to share their webs with the class using the document camera and have other students show a thumbs-up if they wrote similar information in their web. Allow beginning ELs to do the work with a helpful partner. 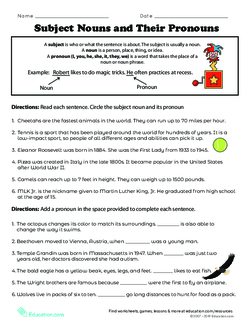 Have advanced ELs read and rephrase directions and word definitions to their classmates. 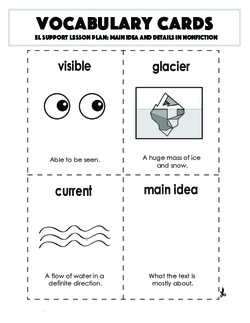 Ask students to find the main idea and supporting details of other nonfiction texts in the classroom. 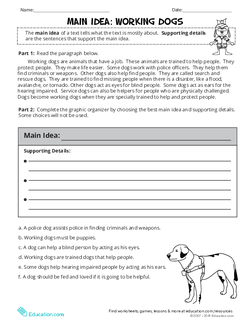 Distribute the Main Idea: Working Dogs worksheet. Read aloud the teaching box and passage. Tell students that for the formative assessment, they have to choose the main idea and supporting details of the text from a sentence bank. Instruct students to complete the assessment independently. Have students share their answers with a partner before sharing with the whole group orally. Ask students why they think it is important to be able to tell apart the main idea vs. the supporting details. Provide the following sentence stem for students to use as they orally discuss the question with a partner before sharing it with the whole group: "It is important to be able to tell apart the main idea vs. the supporting details because..."